Grease a baking sheet, and roll the dough out to fit th e shape of the pan. Layer the center one-third of the dough with the cheese & meats. Sprinkle with bottled Italian dressing, to taste. Using a pizza cutter, cut the sides of the dough diagonally, about every inch. Starting at the top edge of the filling and working your way down each side "braid" the sides by folding strips over the top of the filing, alternating left-right, left right. Be sure to seal the ends of the loaf by tucking the ends up under the "braid." Beat together the egg and dry Italian dressing. Brush over the top of the stromboli. 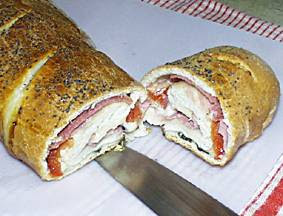 To cook: Bake the stromboli at 350 degrees 15 minutes, just until the loaf begins to brown. Cool completely, wrap and freeze. To serve: Thaw and finish cooking at 250 degrees for 15 to 20 minutes or until brown and the cheese is melted. Variations: Use broccoli and onion; broccoli, ham and cheddar cheese, or sausage and pepperoni. Serves 1 loaf serves 4.